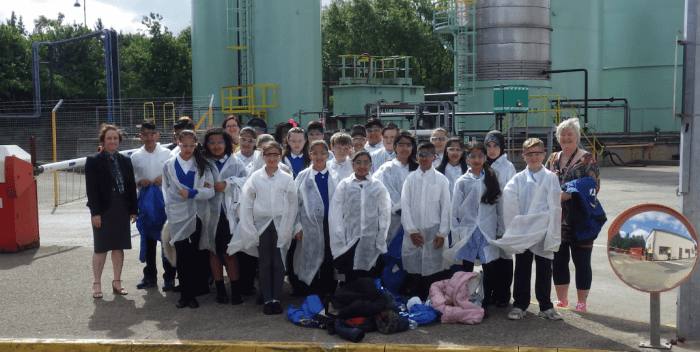 Over the last two days Chemoxy has had a visit from Breckon Hill Primary school part of the Children Challenging Industry Project. We had to groups of 30 children aged between 10 – 11 years old accompanied by their teachers. After their visit round the site the children were shown a short PowerPoint presentation on how we use recipes and equipment such as agitators, tanks, drums and how we mix chemicals to make products for customers and HR spoke about careers@chemoxy and Graduate student spoke about his education and year placement he is on currently with us. Throughout their we gave them specific information on chemicals and their uses and how their education and hard work will help them be successful in future, along with a quiz for the children about what they saw as they walked around the site.